Recovery Theatre of Brantford’s presentation, based on this award winning play, is itself a work of community—our community. 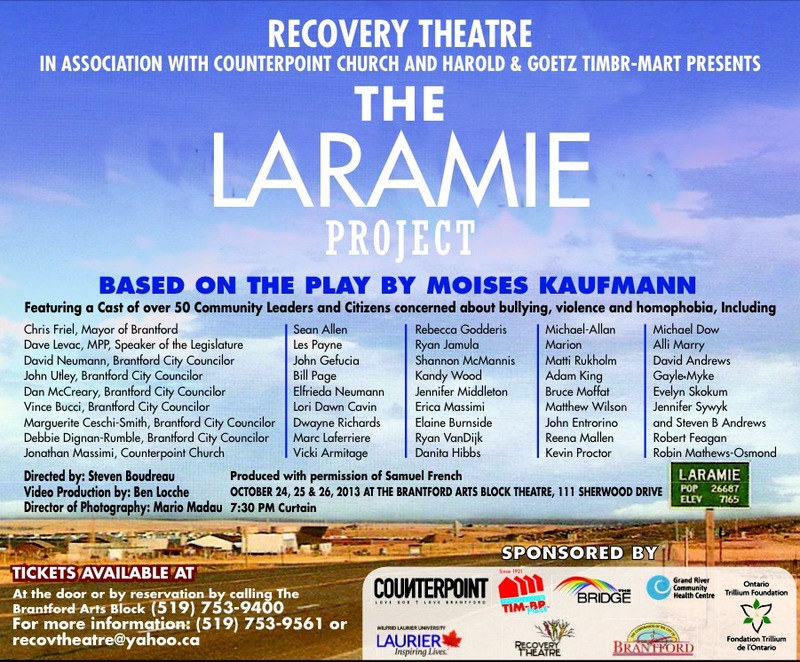 Over the last 10 years, presentations of The Laramie Project have been used as a vehicle for community groups and communities to come together to examine the violent repercussions of bullying and homophobia. Remaining true to this tradition and to its mandate, Recovery Theatre has assembled an impressive list of community leaders and local residents from all walks of like to contribute to this production. Joining this cast of over 50, for example, is our Mayor Chris Friel, the Speaker of the Provincial Legislature and our sitting MPP Dave Levac, City Councilors David Neumann, Debbie Dingnan-Rumble, John Utley, Marguerite Cesni-Smith, Dan McCreary and Vince Bucci as well as various other local leaders and citizens from throughout the City and County including many of the faculty members of The Brant Advocate. Together, they will participate in this dramatic reading of The Laramie Project. In the interest of raising the profile of these important issues, each of the three, scheduled performance of this production, will be followed by a moderated panel discussion on a topic specific to our community concerning the issues of bullying, violence and homophobia. Production dates are October 24, 25 and 26 and the three panel topics will be 1) Education; 2) Religion and Spirituality and 3) Law Enforcement and Justice. Information on the specific titles of these focus groups and who will make up the panel members and moderators will be forthcoming. 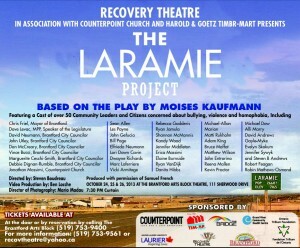 All performances of The Laramie Project will be held at the Brantford Arts Block and they will begin at 7:30 pm. Tickets are $20 and will be available at the door the night of the shows, or before hand by calling the Brantford Arts Block at 519 753-9400.